When the cannon roared to life, spectators sent up a round of cheers. Checkered cloths and baskets filled with fried chicken and fine pastries lay spread across open grass. Children romped. As champagne corks popped, women shielded delicate skin with gaily-colored parasols. Eager to witness the deciding battle, congressmen had brought their families for a picnic. The first men in blue started falling, and mouths gaped at a totally unexpected sight–blood. Lieutenant Samuel Prescott wiped a sweaty brow in the stifling heat. Nerves–no, it was the heat. After hours of waiting in the relative safety of the woods, the regiment marched across a blackened field. Charging men had mowed down the waving summer grass. As they passed the spectators applauded and shoved fists to the sky for triumph. What he wouldn’t give for a cool Maine breeze. Feet… Through the smoke all he could see clearly were the feet of the man in front. Guns pounded as ghostly figures rushed here and there. The boys hustled over a snake-rail fence. One private fell from the top rail and landed on his canteen, denting it. The boys around him laughed. Less than amused, Sam didn’t share their enthusiasm. Certain they would see the elephant soon, he shouted for them to keep marching. The Rebels formed a line. Finally comprehending the danger, the spectators jammed the road with their carriages in chaotic retreat. The order arrived, and Sam shouted for the boys to fall in line. Face to face–a few hundred yards apart. So this was the enemy. The colonel signaled with his sword. Through the deafening volley, canister whistled overhead, spraying the ground with balls of deadly lead. As it tore through the ranks, a number of men went down. The Rebels began their move, and an unearthly yell rose above the frenzy. In spite of the heat a chill of cold terror ran down Sam’s back. He ordered the boys forward. A sobbing private rammed his musket barrel with bullet after bullet without firing. A Rebel shot tore through the boy’s chest, and he fell dead at Sam’s feet. The otherworldly yell came again, and blue and gray merged in hand-to-hand combat. Sam briefly thought of Kate. She had died over a year ago after giving birth, and he was ready to join her. The ground rippled beneath him, knocking him from his feet. He tasted blood in his mouth but seemed in one piece. A cold, sharp blade ripped through his left sleeve, grazing his arm. A wild-eyed Rebel loomed over him and raised the bayonet for another try. Rolling to the side, Sam fired his Colt pistol into the scraggly bearded face. Although spattered by the dead man’s blood, he had shot the Reb just in time. Boys running, the blue line gave way. Some clutched muskets as if they were part of them. Others threw weapons down, turning tail. He needed to get behind them–keep the remaining boys from running. Regroup the others, and keep the line from breaking. But through the smoke, the Rebels swarmed their flank like bloodsucking flies. As Sam got to his feet, a bearded Rebel officer with a sword in one hand and a pistol in the other charged toward him, aiming the gun at his head. Barely recognizable, the gunpowder-blackened face belonged to Colonel Graham, one of his commanders before the war. The Colonel’s uniform was covered in blood, and his eyes remained fixed in the other world of battle. Sam sucked in his breath. He accepted death, but friends didn’t meet as enemies on the same bloodstained battlefield. Unable to pull the trigger, Sam threw the Colt to the ground in surrender. The Colonel’s wife, Amanda, had taken his daughter and cared for her after Kate’s death. She would see to the child’s needs once he was gone. Ready to die by the hand of a friend, he straightened to attention. His first battle would be his last. Eyes burning from the smoke, Sam blocked out fear with thoughts of home. A cool ocean breeze blew gently in his face as he inhaled salt air. He held a glass filled with ice water. Ice was scarce in Virginia. But Virginia was where he had left his daughter in the caring hands of Amanda Graham. The fatal bullet didn’t come. Sam looked over at the Colonel as he lowered his pistol. Friendship registered in the Colonel’s eyes–even on this day while meeting on opposite sides. Between them there was no blue or gray. But sympathy for the enemy could get a man killed. Cannon pounded, and muskets exploded. The field reeked of gunpowder and death. Sam retrieved his pistol and took his position at the end of the line. The Colonel had vanished in a cloud of smoke. Still the Rebels came. An exploding shell muffled a scream. 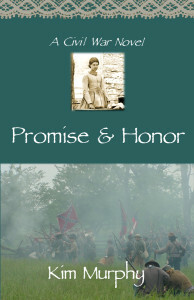 As dirt and gunpowder showered the ground, Sam shielded his eyes with his hand. The veil lifted enough for him to see, and a soldier in blue writhed from a belly wound.
. Staggering slightly, the Colonel’s free hand went to his chest as blood spurted between his fingers. The company corporal stood across from them with mouth agape. They must be quite a sight. Gray helping blue on the battlefield. Light narrowed to a dot, and he felt the Colonel slump. Small but strong hands caught Sam before he hit the ground a third time. What would he tell Amanda? Friends didn’t meet as enemies. Too tired to think. Then blackness. Instead of bringing comfort, his words had the opposite effect. “Bravely? This whole war is foolish–a foolish waste.” Raising the skirt of her black mourning dress, she stepped past Wil and started down the hill. He caught her arm. “I beg forgiveness. I only meant… ” His coal-black eyes flickered in sympathy. Under a different set of circumstances, she would have considered Wil’s offer suggestive. His reputation with the ladies was a well-known fact, not to mention his gambling and drinking activities. Below prominent cheekbones, a neatly trimmed moustache lined his upper lip, and the waves in his hair matched the black depths of his eyes. Even she couldn’t deny a certain attraction. “I thank you for your kind offer. My land is fertile for growing and grazing. We shall manage.” As she strolled down the hill, Wil joined her, with the sword at his side clanking. John and Wil had fought side by side in the war against the Mexicans. Wil had even taken a bullet meant for the Colonel and barely survived. Now he stood beside her, ever so proud and handsome in his gray uniform with shiny brass buttons and fine gold embroidery stitched on the sleeves of his jacket. But John was gone, and she was no longer misled by war’s glory. Many more brave men would die. “How long can it last?” she asked weakly. “I shall be careful,” she promised. When she returned to the parlor, Wil stood as she seated herself on the tapestry sofa across from him. One rumor had him courting a Carolina girl from a respectable family, but another tale was less flattering. Some folks even spread the story that he had taken up with a married woman. On previous occasions, she had ignored idle gossip, but with Frieda’s warning she would pay more heed. He reseated himself in the wing chair. Amanda closed her eyes. Not Sam too. The war had already touched all those close to her. In the year that had passed since his transfer to the New Mexico territory, she had come to think of his daughter as her own flesh and blood, but the feeling went deeper. He never said as much, but she knew she was the reason for the transfer. She would have never betrayed John’s trust. And Sam wouldn’t have respected her if she had, but after Kate’s death, she had encouraged his friendship. As time went on, and his grief faded, she noticed a gentle kindness return to the blue eyes–one of longing. The stooped form of Frieda tapped into the parlor, guided by a cherry walking stick. “Tea is ready, Miss Amanda,” she announced. “I wasn’t suggesting that I take your horses.” He tugged on his moustache. “But I think we should continue this discussion outside.” He pointed at Frieda. His face darkened. Was it pain? But the expression was fleeting and all traces of emotion vanished. “I shall try to tell you what you want to know… in good time. Please accept that for now.” He lifted her hand to his lips once more and gently kissed it. Bowing slightly, he turned. As he went down the porch steps, his sword clanked and spurs jingled. Reaching the bottom, he glanced over his shoulder. Their gazes met briefly. She knew the look and recalled Frieda’s warning. His attention began to make sense. He hadn’t visited to pay his respects to John but as an excuse to see her. Within a fortnight, Amanda wondered what she had let herself in for. Taking an uneasy breath, she brought the stallion, Red, to a halt in a forest glade next to a hundred-year-old oak with a distinctive branch in the shape of a dipper. The tree marked the spot where she was supposed to meet a man by the name of James. Wil had described the man as heavy-set and riding a black horse, but he failed to mention whether James was a surname or his given name. Although she was early, she checked the map to make certain she waited in the right spot. No two trees could have identical branches. Satisfied she had found the proper location, she folded the map and stuffed it in the saddlebag. So far, so good. But what was she to do while waiting? Sitting idle in the saddle played on her nerves. Next time, she would time the pickup better. Next time? She must get through this supply run before thinking of the next one. A chickadee scolded from the ancient oak, and her hands tensed on the leather. She’d much rather be home tending farm chores than waiting alone in some distant Maryland forest. With the tight rein, Red pawed the ground. Loosening her grip, Amanda took a deep breath, and the stallion relaxed. The chickadee stopped scolding, and a cool breeze rustled through the leaves changing from summer green to shades of autumn red and yellow. Wishing she had brought her cloak, Amanda checked her pocket watch. How long should she wait if James didn’t show at the appointed time? Wil had given her few guidelines beyond being careful. Then again, smuggling supplies was probably new to him as well. When another bag was slung across his withers, Red bobbed his head. Amanda opened the first one and checked the contents–laudanum, quinine, bandages. Exactly what Wil had said she would carry. She reached inside the bag to make certain nothing else had been slipped in underneath. Bags of medicine, but no weapons or cartridge boxes. While she confirmed the second bag held more of the same, James tied saddlebags behind her saddle. Satisfied no arms or ammunition had been slipped in, she handed James an envelope. A smile crossed his face when he looked inside. “Pleasure doing business with you, ma’am,” he said, having caught his breath. He reined the black horse around, then stopped. “Tell the colonel that our Washington contact is weary pretending to nursemaid sick soldiers. Next shipment will cost more.” The husky man spurred the black in the side. Carrying James’s bulky weight, the horse groaned in protest as they dashed off. Amanda doubted that Wil would take kindly to the message, but her primary concern was crossing the Potomac. Only a couple of miles from the river, she cued Red to a trot. Wil had wanted her first run to be short–undoubtedly to make certain she wouldn’t bow under pressure. Avoiding the roads, she trotted Red along an animal path through the forest. Ducking to miss an overhanging branch, she brought Red to a walk. Up ahead, she heard the rushing of water. The Potomac… On the other side, Wil would be waiting for her. She halted Red at the edge of the forest, where a gentle slope of waving grass dipped down to the ford in the river. The Confederate picket line would be watching for her. So why was she suddenly uneasy? Red tugged on the bit to get moving. Still, she waited. With a shiver she squeezed Red to a brisk trot. Once on open ground, Amanda focused on the swift running water a few hundred yards away. Nearly home free, she heard hooves pounding like a drum behind her. A quick glance over her shoulder confirmed her fear. Yankee soldiers… Two scouts in hot pursuit. The leather reins slid through her fingers as she urged Red to a gallop. As she neared the river, a soldier from the picket line fired a warning. Weighted down with supplies, Red was unable to outdistance the Yankees. A corporal on a moth-eaten buckskin pulled even and seized the reins, twisting Red’s head around in an attempt to stop the stallion. Reaching in her saddlebag, Amanda leveled a pistol at his chest. He let go of the leather and raised his hands. “I wouldn’t hurt a woman,” he said in a rush. A bullet whirred overhead from the picket line. Horses were crossing the river–at least a dozen with a blue roan in the lead. The stubble-faced corporal whirled the buckskin around, shooting off at a gallop, traveling in the dust of the other scout. As the Yankees reached the edge of the forest, the roan halted beside Red. The remaining Confederates continued the pursuit. “Amanda… ” Still shaking, she bit her lip and looked over at Wil. “Are you all right?” he asked. He let out an uneasy breath. “Very well. Return to camp.” With the order, he spurred the roan in the side. Shifting around in the saddle, Amanda guided Red into the dark waters of the Potomac. With her attention focused on reaching the Confederate side of the river, the swift current caught her unaware. Red hit a deep spot and began swimming. Cold waves lapped near the top of the saddle, sending a chill through her bones. She sucked in her breath as the current grew stronger. Red compensated with powerful strokes of his legs. His feet finally touched bottom. She clucked her tongue at him, urging him forward. He climbed the bank, and she brought him to a halt at the picket line. “Much obliged for your help,” she said, breathing in relief.